Childhood nostalgia is such a personal thing that debating the merits of that which brought us so much joy in our youth seems like a pointless endeavor. Similar to the never ending Coke versus Pepsi debate, there can never be a right answer. It all boils down to personal taste. Of course that has not stopped countless passionate souls from attempting to sway others with the importance of their childhood memories. One need look no further then the longstanding The Goonies versus The Monster Squad debate that has consumed many of local cinephiles I associate with. While there were numerous films that made up the seminal 80’s canon of kids movies – seriously, the art of smart child-based adventure films has never been as strong as it was in the that decade – the similarities between The Goonies and The Monster Squad, were enough to draw battle lines in the sand for many. Having grown up only seeing The Goonies which, like many of The Monster Squad disciples, I watched numerous times, I had to abstain from such rambunctious discourse. Now that I have finally caught up with Fred Dekker’s film, I will have to take the Switzerland position and remain neutral. The fact is I enjoyed them both for different reasons. While I will always have an affinity for the sense of adventure that The Goonies evoked in my young mind, I am pretty sure my younger self would have eaten up The Monster Squad as well. Although the film does not have the powerhouse team of Richard Donner, Steven Spielberg and Chris Columbus behind it, the film is surprisingly economical with what it has to work with. Playing like an introductory horror film for the pre-teen set, the film follows a group of monster fanatics whose knowledge is put to the test when classic movie monsters threaten to destroy their town. The bulk of the story involves the villainous Count Dracula (Duncan Regehr) pulling a team together – which includes The Frankenstein Monster (Tom Noonan), The Wolf Man (Carl Thibault), The Mummy (Michael MacKay) and The Gill-man (Tom Woodruff Jr.) – to seek out both an ancient amulet, that his old nemesis Van Helsing unsuccessfully attempted to use over a 100 years ago to banish him, and a diary that holds to incantation that unlocks the amulet’s power. As luck would have it the latter has fallen into the hands of Sean (Andre Gower), a young boy who just happens to run a monster’s appreciation club in his treehouse. When Sean and his ragtag group of friends become aware of Dracula’s intentions, they only have a limited amount of time to try and finish what Van Helsing started. Backed by a humorous screenplay by Dekker and Shane Black, the latter of whom had his first screenplay, Lethal Weapon, also hit theatres the same year as The Monster Squad, the film does a solid job of blending the horror-comedy beats with an honest representation of adolescences. Unlike The Goonies, where one of the characters can make ridiculous gadgets that only seem plausible in the movies, the protagonists in The Monster Squad feel like regular kids you would see playing on the streets in any community. Despite the fantastical situation that Sean and his friends find themselves in, the characters feel authentic. Everything from their encounter with bullies to the turbulent relationship of Sean’s parents to the curse words the kids use, though politically incorrect when viewed with modern lenses, is easily identifiable. While the film does ask viewers to take several leaps in logic, such as when Sean quickly deciphers that Mr. Alucard = Dracula, it is no different than the suspension of disbelief required for 80’s gems such as Gremlins or Teen Wolf. Plus, The Monster Squad is never shy about giving several winks to the audience. The film not only shows its love for classic monster movies, but also several pop culture staples like The Hardy Boys and Stephen King. If the benchmark of a solid children’s film is its ability to both empower and entertain younger viewers, then The Monster Squad achieves both of those objectives. While not a perfect film, it is one that deserves to be viewed with that same nostalgic eye that is still showered upon many of its peers today. When the principle in the film remarks that “I was a kid once, I thought monsters were cool,” I could not help wish I that had discovered the cool monster loving joy of this film when I was a kid. Tags: 1987, Andre Gower, Blind Spot, Brent Chalem, Chris Columbus, Comedy, David Proval, Duncan Regehr, Film, Fred Dekker, Gremlins, Horror, Jason Harvey, Jon Gries, Leonardo Cimino, Lethal Weapon, Lisa Fuller, Mary Ellen Trainor, Micahel Faustino, Review, Richard Donner, Robby Kiger, Ryan Lambert, Shane Black, Stan Shaw, Stephen Macht, Steven Spielberg, Teen Wolf, The Goonies, The Monster Squad, Tom Noonan, Tom Woodruff Jr. 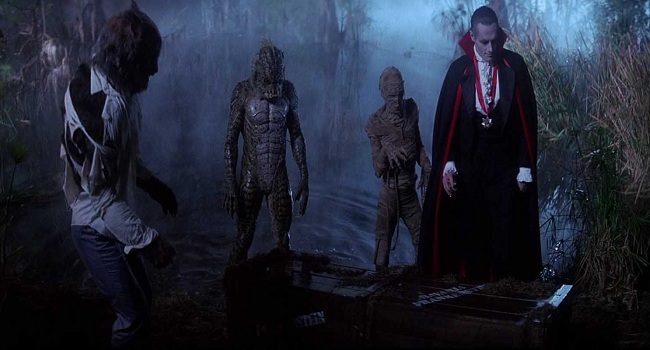 I know the film is far from the typical classics most people select in their Blind Spot pieces, but The Monster Squad was one that I had been meaning to catch up with for quite a while. I’m quite charmed by your stance of neutrality! While social media may disagree, marriage has taught me that not every argument needs a winner/loser. Sometimes you have to embrace neutrality and simply appreciate both sides of the debate.